U.S. Pacific Fleet Master Chief Marco Ramirez visited U.S. Navy Support Facility Diego Garcia Aug. 26-28 to tour facilities and speak to Sailors stationed on the island. 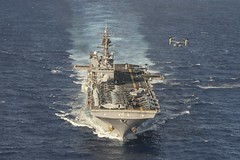 The guided-missile cruiser is set to depart Hawaii Aug. 29 for a new homeport in San Diego. 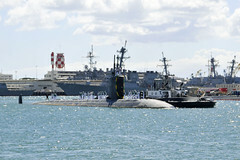 The Los Angeles-class fast attack submarine returned to Joint Base Pearl Harbor-Hickam Aug. 25 following a deployment to the U.S. 7th Fleet area of operations. Active duty and reserve Sailors stationed across the Korean peninsula visited the Aikwangwon Social Welfare Foundation at Koje Island, Aug. 24, for a community outreach project with residents and staff. A Navy-funded study to continue documenting blue and fin whale distribution, occurrence and movement patterns along the U.S. West Coast and throughout the Eastern Pacific began July 31. The amphibious assault ship, along with the embarked 11th Marine Expeditionary Unit, arrived in Hong Kong Aug. 20 for a port visit. 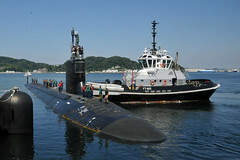 The Virginia-class fast-attack submarine arrived at Fleet Activities Yokosuka Aug. 20 for a port visit. 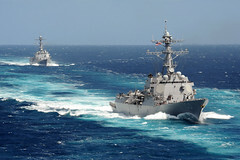 The guided-missile destroyers are scheduled to return to San Diego Aug. 21 following completion of separate deployments to the Western Pacific and Indian Oceans. 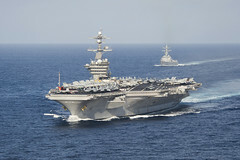 The strike group will depart San Diego Aug. 22 for a scheduled deployment to the Western Pacific and U.S. Central Command area of responsibility. 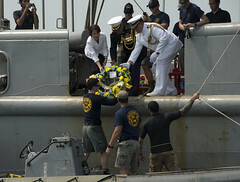 U.S. Navy underwater archeologists, in conjunction with Indonesian Navy divers, have assessed in an interim report that the wrecked vessel surveyed in the Java Sea in June is "consistent with the identification" of the World War II wreck of the cruiser USS Houston (CA 30).